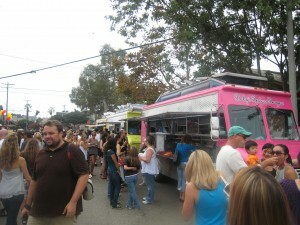 By my count, there were at least 10 trucks listed on FindLAFoodTrucks.com parked all in one place at the festival. Having a "food truck alley" made it easy to try a new truck or assemble a multi-course meal with your favorite dishes from a variety of trucks. It is clear how much Venice loves these trucks. You would think ten trucks may be a bit much, but they all had lines throughout the course of the day. This was a long, crazy day for the trucks, but they seemed to handle it fine. We will announce other events that will have multiple trucks here on the blog, so stay tuned. DineLA Restaurant Week will have a roving food truck featuring a different chef each night. The press release states that there will be complimentary food. 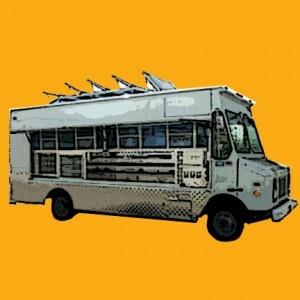 The truck will be tweeting throughout the week, which you can follow here at FindLAFoodTrucks.com. This one is pretty self-explainatory, but don't expect any processed cheese between white bread. Instead, think premium breads with heirloom tomatoes, buffalo mozzarella and fresh basil. Or, how about a California melt made with smoked turkey, avocado, bacon, tomato, Monterey jack and cheddar? Those do sound great, but I am really excited for the "Cheesy Mac & Ribs" sandwich, which happens to be my favorite bbq meat and my favorite bbq side put together in a grilled sandwich. Look for the Grilled Cheese Truck starting in October. I can't wait to try what I believe will be LA's first gourmet breakfast (at any time of day) truck. They will have a variety of pastries, omelettes, pancakes and breakfast sandwiches. The breakfast sandwiches will most likely be my go-to as they are served on homemade buttermilk biscuits. The fried chicken and buttermilk cinnamon waffles, which will replace the pastries on dinner and late-night runs, also sound incredibly promising. If they add a sandwich with fried chicken between the biscuits, I don't think that I could ask for anything more. The Buttermilk truck should hit the streets in November. This truck will be serving up gourmet french-fries with a variety of toppings. The core menu will be Chili Cheese Fries, Vegan Chili Fries, Rajas Fries, Kimchi Fries, and Chicken Sweet Potato Fries. I never thought of fries as a full meal, but these options make me reconsider that. The only challenge will be eating all this without spilling on my shirt. This truck should be hitting the streets within a week or two. I can't find much information about this truck except they will be serving sweets and gourmet coffee. I'll be on the lookout for more. Thank you for visiting the blog. So far, everyone really seems to really like the site. It has already been proven as a useful tool both to us eaters and to the trucks themselves. This blog is the first of a number of expansions we have planned for the site. We want it to be your source for food truck news, reviews, interviews, profiles, and any other sweet stuff we (and you) can think of. So, if you have any ideas or submissions for the blog, hit us up at info@findlafoodtrucks.com. Again, thanks for visiting the site, and thank you to the tweeters and bloggers who have helped spread the word so fast. Don't forget to show love to your local, old-fashioned, non-twittering taco trucks. They are the OG's of all of this and deserve much love and respect!